Yes, the Forest Lodge Library IS open today, Good Friday! We will be open tomorrow, Sat. 4/20, as well. Spend a little bit of time on our Poetry Contest…see the entry in Library News! 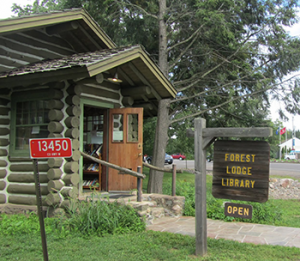 Lodged in a rustic 1925 built log cabin, the Forest Lodge Library is a joint library of the Cable and Namakagon communities and is located on County Highway M in downtown Cable, Wisconsin. The library is open six days a week and its services and programs are available to area patrons and visitors alike. The library shares a campus with the Cable Natural History Museum and both facilities are destinations you won’t want to miss when in the Cable/Namakagon area. Take classes in anything from basic accounting to romance writing, from web design to conversational French. Director Lendved goes to Pre-School! April is National Poetry Month! We celebrate poetry! In past years we've offered poetry readings or opportunities to craft "black-out poetry"...using pages from recycled books and "finding" a poem on the page and blacking out the rest of the words. THIS year we're going to try a Virtual Poetry Jam!For a number of years Library Director Kristine Lendved has managed a poetry writing competition for the Namekagon Art & Music Festival. (plan to participate on July the 6th) Participants are assigned 3 words and have an hour to craft those three words into poem of any style or length. So...we're going to try a VIRTUAL version of that! And, yes, there will be prizes. Choose one of sets of words of the three offered below. (the bottom 3 are aimed at our more juvenile competitors.) Use them in a poem...of any style or length! Try to accomplish it in about an hour...although we're clearly on the honor system, eh? You can email the poem to Director Lendved: klendved@cable.wislib.org or drop it off or send it to the library, P O BOX 176, Cable, WI...or you could post it to our Facebook page! IF you do NOT want us to share your work, please say so. We will otherwise be sharing the poems we receive at the library and on the website and via social media. We hope you'll participate! Poetry lives! Whether through donations of time, money, or materials, your support is what makes our library GREAT!